With a fine art sculpture degree specialising in wooden constructed pieces, Mike initially moved into carving as a hobby. It was only after he designed and made a garden bench that was sited in a community centre in Llangollen that the resulting interest and commissions caused him to recognise that he could develop this talent into a career. However, it is one that runs parallel to the continuing management of his woods, where through selective felling and coppicing, a vibrant, diverse environment has flourished. Nature's exuberances are regularly matched by the children attending Flintshire Forest School, which is based in one of the woods and the general public can circle the deserted medieval village of Hen Caerwys on the footpath Mike created. 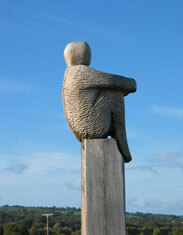 MIke specialises in site specific, low maintenance sculpture and furniture. He is able to design pieces around a specific budget, and will adapt his designs to suit even the most challenging of sites. Mike also welcomes enquiries from schools and other organisations wishing to create or improve their own Forest School/ Wildlife area. A wealth of experience in woodland management and planting, combined with his creative flair will benifit anyone wishing to create their own outdoor classroom. Mike is available for commissions. To enquire please get in touch with Mike directly.